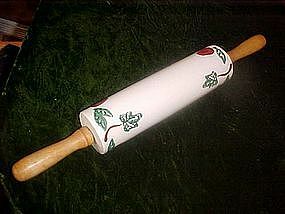 Full size rolling pin in the popular apples and Ivy pattern. Made of a nice pottery and design has a sponged on effect, with a nice glaze finish. Wood handles. Measures a total of 19" long. Perfect condition. I have a few other pieces listed in my catalog to this pattern.